an Aboriginal and Torres Strait Islander employment strategy. which strategies are directly funded by ISSP, partly funded by ISSP or funded by other university resources. UNE provides a safe and welcoming environment for Indigenous students. This has grown our reputation as a university of choice for Aboriginal and Torres Strait Islander students. The School of Business and Law PEER mentoring program for all students was promoted to Indigenous students to engender a feeling of inclusion and as an academic support. Oorala and the School of Health ran “Youth Development Day” – this outreach activity is a one-day orientation workshop providing interested Indigenous people with an introduction to the Bachelor of Nursing. The School also ran a Mentor Program for Indigenous Bachelor of Nursing students offering up to two hours of mentoring per unit/per week. During the year Oorala ran 4 camps and 4 experience days for Indigenous high school students. The camps attracted 81 students and was support by $200,000 in HEPPP funding. The Experience Days attracted 66 students and was supported by $46,500 in HEPPP funding. lead to greater uptake of mathematics in years 11 and 12.
increase the number of Indigenous graduates who will have the capacity to pursue science-based careers in the future. Two Aboriginal designated positions exist within the customer services and admissions team. These staff provide support for Aboriginal and Torres Strait Islander inquiries. The HEPPP-funded Kruki Program was implemented in 2017 for the third consecutive year. The five-day residential program was attended by 14 high school students (years 9 -12) of Aboriginal background who were interested in studying medicine at UNE. The Joint Medical Program has an Indigenous entry pathway through the Miroma Bunbilla Aboriginal and Torres Strait Islander Pre-entry to Medicine Program hosted by UNE and the University of Newcastle. In 2017, we had one student commence medicine at UNE from this program. Apart from Commonwealth Equity Scholarships, UNE offers a wide range of scholarships specifically for Indigenous students at UNE, both publicly funded and from private donors. In 2017, Oorala began a collaboration with the NSW Aboriginal Housing Office to make available accommodation scholarships to Indigenous students at UNE. The School of Business and Law’s Aboriginal Support Officer, in conjunction with the Oorala Centre, coordinated several meetings with potential scholarship providers from some of Australia’s major accounting firms to offer Indigenous scholarships in 2018. The NSW Department of Education provides scholarships for students to teach in high Aboriginal student enrolment schools (known as the Enhanced Teacher Education Training Project), to address specific issues in working with Aboriginal children in schools and with their local communities. Each student must undertake a project with the local Indigenous community, local Elders and Aboriginal Education Officers in schools. This project, coordinated by the Head of School, must be approved by Oorala, to ensure cultural appropriateness, as well as sustainable outcomes for the students at the school and in the local community. Enhanced links were made with Oorala to provide local indigenous knowledge in a formal manner to the students involved. A total of 114 Indigenous students were enrolled in UNE Enabling Programs in 2017. 35 students were enrolled in UNE award courses who had come through a UNE Enabling course. Ongoing alternative entry program offered on campus and online through Oorala; Tertiary preparation assists Indigenous students to develop their study skills and their transition to mainstream UNE courses (TRACKS includes five core TRAX units and one undergraduate unit). In 2017, there were a total of 74 students enrolled in Oorala's TRACKS program, comprising 52 commencing and 22 continuing students. 52 students were enrolled off campus and 12 on-campus. Internal Selection Program (ISP) Aboriginal and Torres Strait Islander applicants (18 years and over) Ongoing alternative entry program offered on campus through Oorala; Testing and assessment for UNE course admission; applicants are either recommended for admission to their selected UNE degree or alternatively the TRACKS Program or other tertiary study options. From 2017 onwards candidates can take the ISP test at UNE Sydney campus in Parramatta. In 2017, 13 prospective students participated in the ISP program for admission to commence undergraduate study in Trimesters 1, 2 and 3, 2017. UNE Pathways Enabling Course All applicants who do not meet standard entry requirements for UNE undergraduate courses and have not successfully completed any part of a university course. Ongoing enabling program offered online through UNE. It prepares students for admission to UNE undergraduate courses. Pathways includes two foundation units and two undergraduate units, with mentoring and additional tutorial support. 40 Indigenous students were enrolled in UNE’s Pathways Enabling Course in 2017. 29 of those were commencing students. The School of Arts ran a practice-led honours-level research project in Theatre Studies. This included community outreach involving Indigenous Elders and creative practitioners, as well as a successful public performance supported and promoted by the School. Dr Jenny Wise led a criminology information session for 20 Indigenous high school girls as part of the Senior Girls Youth Leadership Development Camp on 24 August. On 21 September Criminology staff held a ‘Meet and Greet’ lunch with Indigenous Criminology students. Dr Natalie Thomas led a criminology information session for 35 Indigenous high school girls as part of the Oorala Aboriginal & Torres Strait Islander Junior Girls Camp, 1-3 November. Dr Natalie Thomas and Dr Helena Menih led a criminology information session as part of Oorala Aboriginal Centre’s University Experience Days for Aboriginal and Torres Strait Islander year 10 and 11 students from local high schools on 13 December. Adjunct Senior Lecturer in Linguistics, Margaret Sharpe, met with the Yugambeh Language Advisory Committee at the Yugambeh Museum at Beenleigh, Qld, in May to finalise the Yugambeh language orthography, and plan what should be covered in a last semester 2017 introductory course in classes in some schools on the Gold Coast, the traditional country of the Yugambeh people. There are number of ongoing research projects with Aboriginal communities. For example, a participatory model of community engagement in collaboration with the Bourke and Enngonia Aboriginal communities. An informal session with community members was hosted by BCSS researchers. A HSC Booster Day for year 12 students from rural and regional NSW was held. The Schools particularly encourage Aboriginal and Torres Strait Islander students to attend. Meals and accommodation were provided for students living over 100km from Armidale. The Schools provided intensive help to students with their HSC studies, a campus tour and hands on activities. 900 students attended this event and over 400 were accommodated. “Far Out Science” target audience is Aboriginal and Torres Strait Islander students from rural and remote areas and low socio-economic areas. The event targets both primary school (years 5-6) and high school students (years 7-9) and their teachers. Far out Science is a two day event held at UNE to showcase the wide world of science and to celebrate the fun, exciting and intriguing side of science. The Riddim & Poetry project aims to support Aboriginal school children’s engagement with school and nourish their literacy skills through rhythm and poetry workshops. The workshops, designed and delivered in collaboration with Beyond Empathy (a not-for-profit organisation – http://be.org.au/), focus on enabling students to use and learn the local Aboriginal languages spoken in the Armidale area. The workshops were implemented at Minimbah Aboriginal School in October and November 2017. The School of Health is a member of the Congress of Aboriginal and Torres Strait Nurses and Midwives (CATSINaM) – the peak body representing Indigenous nurses and midwives in Australia. Each year CATSINaM holds an annual Professional Development Conference. In 2017, this was attended by Professor Kim Usher (former Head of School), an academic nursing lecturer and four indigenous nursing students. Over the three decades since the Oorala Aboriginal Centre was established, UNE has been committed to the challenging and rewarding work of helping Aboriginal and Torres Strait Islander people find purpose and meaning in education. 2017 saw the largest growth in Indigenous enrolments at UNE with a total of 879 having been enrolled in UNE courses, reaching 3.57% of the total student population – a 0.5 percentage point increase over 2016. Total EFTSL for Indigenous students at UNE reached 442.5. Student Profile – prepared 11/12/2017 by UNE Corporate Intelligence Unit. This is the 6th year of sustained growth in Aboriginal student enrolments. This increase in enrolments is also reflected in post-graduate degrees with an increase of 35 enrolments (142 compared to 107). This may be an indication that Oorala’s work with UNE Research Services in attracting and better supporting postgraduate students is paying dividends. It is also noteworthy that the number of Aboriginal and Torres Strait Islander students studying on-campus continues to grow with 194 on campus enrolments for 2017, an increase of 32 over 2016. This continues the growth trend of on-campus students evident for the last 5 years. Conversely, enrolments in Trimester 3 were almost exclusively online, with less than one percent of units taken by Indigenous students in Trimester 3 being studied on-campus. Overall, Trimester 3 saw an increase of 28% in the number of units attempted (753 compared to 590 in Trimester 3 2016). Over the last two years the Oorala Aboriginal Centre at UNE has been primarily focussed on student retention and success. However, UNE has continued to experience a considerable rise in student numbers as well. 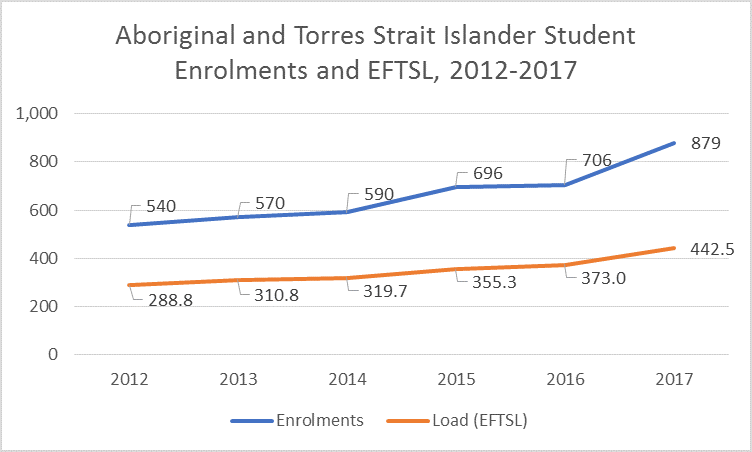 The number of Aboriginal and Torres Strait Islander students from remote and regional areas continued to grow in 2017, reaching 566 (302.2 EFTSL) or 64% of all Indigenous students. This is an increase of 17% over 2016. Since the introduction of Oorala’s Integrated Student Engagement Plan in mid-2016, the Targeted Tutorial Assistance Program has shown encouraging results. Throughout 2016 and 2017, the Oorala Aboriginal Centre introduced a number of strategies designed to improve Aboriginal and Torres Strait Islander student outcomes. During 2016 Oorala transformed its practices to a pro-active model of student engagement. This was essential as students reported through the University Experience Survey (Quill) that they felt less engaged and supported compared to other students at UNE. Improving the use of technology to contact Aboriginal students via UNE’s Student Relationship Management (SRM) System, developing the Aboriginal and Torres Strait Islander Moodle Site (The Hub), expanding the use of Facebook, and pro-active contact with students at the time of their enrolment (pre-commencement). These measures appear to have had a tangible effect on the uptake of tutorial assistance, access to the Oorala Aboriginal Centre, requests for support and the use of SRM and Moodle in providing support services and follow-up of student inquiries. The Grade Point Average (GPA – the average result of all the grades achieved throughout a degree) for Indigenous students receiving tuition at UNE rose substantially and the GPA gap between non-Indigenous students and Indigenous students taking up tutorial support has narrowed dramatically, to just 0.34 in Trimester 2 2017. At our 2018 autumn graduation, UNE has graduated 44 Aboriginal and Torres Strait Islander students — more than ever before in an autumn graduation cohort. The number of continuing Indigenous students in 2018 has risen significantly from 379 in Trimester 1 2017 to 429 in Trimester 1 2018: a 13% improvement. The Progress Rate for Indigenous students enrolled in award courses in 2017 was 64.5% (Student progress rate (SPR) based on weekly extract data – prepared 26/03/2018, SPR = EFTSL passed / EFTSL completed (includes: pass, fail, withdraw; excludes: result unknown). The UNE Business School and School of Law used HEPPP funding to appoint a full time Aboriginal student support officer to provide both support to existing UNE Business & Law students, and to engage with year 10–12 high school students from the New England and north-west regions of NSW to encourage university participation and interest in careers in business and law. Twelve high schools were visited and over 200 students engaged with. In conjunction with the Oorala Centre, two Aboriginal Youth Development high school student camps (one male, one female) where held during the year, with the direct involvement of the Schools Aboriginal Support Officer. Approximately 60 students attended the camps, with specific educational awareness sessions run the Business and Law Schools, including a mock trial in the UNE Moot Court, and financial management & careers sessions in the Business School. The School of Education held and Indigenous Student Lunch. This was hosted in the School of Education by Adele Nye with School funds. Uses Oorala’s Direct Entry (Interview Pathway) – an alternative pathway for enrolment for Indigenous nursing student. The School employed an Indigenous Student Liaison Officer (Aboriginal Health) to provide academic and other support. In 2017 Oorala employed a dedicated staff member in our Student Support team to manage our tutoring program. We also embarked on a project, in partnership with UNE IT Services, to build an online system to handle applications from tutors and students, matching students with tutors and the payment system. The basic elements of this system were launched in late 2017 and development continues in 2018. As per the GPA figures on page 9 of this report, tutoring has a significant impact on the GPA and success rate of Indigenous students. Oorala continues to prioritise academic support and tutoring. Oorala had around 20 staff at the end of 2017. The Centre has experienced consistent growth in staff over the last few years, matching UNE’s growth in Indigenous student numbers. The Centre’s HEPPP and teaching revenue continues to increase, as per our accompanying budget statement. UNE uses 100% of its ISSP grant to be administered by Oorala for the support of Indigenous students. The School of Arts Operational Plan 2016–2018 included a new initiative – Indigenous Arts and Knowledge – with the School to become a hub for the development of Indigenous-based arts curricula aimed at recruiting and retaining higher Indigenous student numbers and developing high-profile branding around Indigenous research and epistemologies, especially related to the creative arts. THEA318: Minorities and Majorities in Australian Theatre. This unit explores issues of power and identity (including gender, race, class and sexuality) within the context of recent Australian Theatre. Some of the topics to be covered are: women's theatre; multicultural theatre; Aboriginal theatre; and gay and lesbian theatre. The BCSS Teaching and Learning Committee flagged making OORA 200 (run by Oorala) as a core or listed unit in courses offered by the School for 2018–19. The Clinical Psychology Program provided students with a two-day intensive school delivered by an Aboriginal Psychologist to support an understanding of sociocultural issues relevant to Aboriginal and Torres Strait Islander peoples. The School had 21 units with some Indigenous content including languages, linguistics, (e.g. LING 244 Language and the Law), psychology and sociology. Indigenous issues are a feature of most of the criminology units (such as: CRIM314, CRIM324, CRIM305, CRIM306), which include Indigenous perspectives provided by guest lecturers. The staff at the Institute of Rural Futures (IRF) had research projects looking at Indigenous natural resource management and involved indigenous HDR students. The School worked with Oorala to include Aboriginal water rights in the environmental change unit (GEPL308/508). Indigenous content is embedded in a number of courses and units through UNE Business School, e.g. MM591 ‘Managing Across Cultures’ and MM545 ‘Organisational Leadership’ which includes topics regarding ‘Employing Indigenous Australians’; also MM200 ‘Contemporary Management’ has a broad focus on cultural diversity and social inclusion is addressed. The UNE Business School’s Master of Economic and Regional Development includes a major in Indigenous Futures which seeks to prepare students for a career involved in community and regional development projects. Acknowledgement of Country is included at the beginning of every formal lecture (and lecture recording). Aboriginal and Torres Strait Islander Cultures and Histories is a cross-curriculum priority area in the Australian Curriculum. Selected resources, texts for student analysis and readings incorporating Indigenous perspectives are included in unit materials and activities. All Course and Unit Coordinators are specifically invited to include Aboriginal and Torres Strait Islander perspectives, readings and education implications in their courses and units. All Education courses (undergraduate and postgraduate) include Aboriginal Education units, which detail Aboriginal and Torres Strait Islander perspectives and also cover the history of education, policy and government acts in Australia with implications for Aboriginal and Torres Strait Islander people. Traditional Ecological knowledge is taught in first year in ECOL100 (Ecology: Concepts and Applications) and at higher levels (e.g. EM353 Conservation Biology). Our lecturers explain that Science is one of many knowledge systems, but that it is important to consider other systems for additional information that can inform holistic management of ecosystems. An important axiom of what we teach is that traditional knowledge depends on country for its context and significance, and that Aboriginal systems of knowledge are place and people specific. Throughout the programs ERS also have a number of elective units that consider natural resource management and policy in which Aboriginal and Torres Strait Islander traditional and contemporary culture values are addressed. In 2016 ERS had a review of Environmental Science courses at UNE and the Oorala Aboriginal Centre provided comprehensive consultation response as below. Consequently, one of the recommendations in the review report was for increased and mapped integration of Indigenous perspectives into the degree and units, and to work with the Oorala Centre to explore pathways to better enable Aboriginal and Torres Strait Islander students to pursue the degrees. The recommendations of the report are for a 5 year period. To work with the Oorala Centre is to be implemented. As part of a curriculum review, Social Work staff consulted with Oorala to get feedback on new units to involving Indigenous content to ensure they were culturally appropriate. Ten Indigenous studies units are offered by the School of Humanities, covering diverse areas such as Indigenous History, Health and Community Development. demonstrate that they are committed to providing culturally competent, holistic, patient-centred care for Aboriginal and Torres Strait Islander peoples. apply fundamental tools and principles of epidemiology to identify and measure the burden of illness of major health challenges facing Australia and other countries, including the gaps in health status and outcomes of Aboriginal and Torres Strait Islander people. Within the UNE Bachelor of Laws program there are 6 core units and 6 elective units that include Aboriginal and Torres Strait Islander content (LAW101, LAW157, LAW164, LAW272, LAW281, LAW301, LAW312, LAW313, LAW314, LAW341, LAW358, LAW389, LAW400. For example, the core unit LAW101, Law in Context, includes Race and the Law with a focus on the colonization and the historical treatment of Aboriginal and Torres Strait Islander people. In 2017 a total of 112 staff participated in the Cultural Connections workshops from February to November. The aim of this program is to affect positive change at an individual, structural and organisational level and our approach to the way that we engage with, employ and retain our Aboriginal and Torres Strait Islander workforce. The Senior HR Consultant (Aboriginal Employment) and 15 other staff and students from UNE attended the World Indigenous Peoples Conference on Education (WIPCE) in Toronto, Canada. This was a great opportunity to share and draw on the successes of strategies for culturally grounded Indigenous education from across the globe. The Senior HR Consultant Aboriginal Employment, Pam Widders, continued her ongoing consultation meetings with Faculties and Directorates around Aboriginal employment opportunities and providing a culturally inclusive environment for all staff. Ms Widders presented workshops to medical students and staff on working with Aboriginal communities to staff and students in the School of Rural Medicine and School of Health (Nursing). UNE has established a Diversity Advisory Group, consisting of student and staff representatives. The Advisory Group is chaired by an external representative and reports directly to the Vice-Chancellor. This group has Aboriginal staff representation and has the remit to review all relevant policies, rules and procedures. The 8 undergraduate students who attended the WIPCE conference were fund from HEPPP. All other initiatives were funded from within the university’s operating budget. The School established a dedicated Indigenous Research room for postgraduate and undergraduate students to hold meetings, workshop their research, and mentor students in the Arts Building. The School continued the Aboriginal and Torres Strait Islander Scholars program with three HDR students continuing to receive scholarships from UNE to pursue their studies. During 2017 the School supported Indigenous students to attend national and international conferences including: presentation at the Australian Screen Production, Education and Research Association conference on the Gold Coast; and participation in the World Indigenous Peoples Conference on Education (WIPCE) in Toronto, Canada. Proposal to create a part time position (initially 0.2) for an Aboriginal Liaison Person. The School’s Aboriginal Support Officer delivered several presentations to both Schools to raise awareness of the general number of Aboriginal students that were in those Schools. The Support Officer met with many individual academics to raise awareness of the perception that Aboriginal students may feel more isolated than non-Indigenous students. It was also necessary to inform the academic staff that there were Aboriginal students in most of their units, but most academics were unaware of them. Report progress against targets and milestones outlined in the strategy. The need for KPIs on Indigenous employment to be included in the UNE Business Plan. The findings of the report and the recommendations are currently being drafted into a brief for senior executive. This brief will be delivered in May 2018 to the Provost and Deputy Vice-Chancellor. There are no ‘surprises’ in this brief and we are optimistic that the recommendations will be acted on during 2018. Provide effective academic scaffolding and support services. Innovate in the recruitment and retention of regional, remote and Aboriginal and Torres Strait Islander students and staff, particularly within the New England region. Employ innovative recruitment and retention activities aimed at regional, remote and Indigenous students, particularly within the New England region. Develop innovative partnerships focused on students from low SES areas and Indigenous students (e.g. alternative entry pathways, scholarships, strategic courses) that build capacity in these students and their communities. Ensure our graduate attributes promote social and cultural understanding including an appreciation of Indigenous culture and history. Establish alternative pathways and academic support programs that address Indigenous and low SES student participation in higher degree programs. UNE does not have a reconciliation plan. However, UNE does have a Reconciliation Statement that is available on the website. Note that in 2017, the Department will work with institutions to establish an Indigenous workforce target of 3% where such a target does not already exist. other activities to involve Aboriginal and Torres Strait Islander people in the decisions of the university, curriculum development and/or evaluation/review. As per the answer to section 4 above, the particular Indigenous governance mechanism at UNE is currently awaiting a brief to the Provost and Deputy Vice-Chancellor. Oorala is confident that a plan will be in place during 2018 in response to the ISSP guidelines. The current most senior Indigenous employee at UNE is the Director of the Oorala Aboriginal Centre, Mr Gregory Davison. Encouraging and increasing Indigenous representation within governing and decision-making bodies, such as the University of New England (UNE) Council, Academic Board and other university committees, as well as in management positions, is a core focus for UNE, as set out in the University’s Strategic Plan. Lisa Shipley, an Indigenous lecturer in the School of Rural Medicine, is a member of the UNE Academic Board. Human Research Ethics Committee (HREC) includes the Oorala Director. Aboriginal & Torres Strait Islander Employment Strategy Governance Committee: Oorala Indigenous Academic Advisor and UNE Aboriginal Employment Officer. Student Administration & Services Forum: Oorala Student Services Manager. In the School of Health, the CEO of the Congress of Aboriginal and Torres Strait Nurses and Midwives (CATSINaM) is a member of the Bachelor of Nursing stakeholder group. UNE’s WH&S Working Group, HR User Group and Finance User Group: Resource & Compliance Officer. The University’s academic schools take advice from advisory committees, with both internal and external representation (depending upon purpose) at the School, discipline or course level. This is designed to ensure that perspectives and needs of key stakeholders are included. For example, the School of Health consults and reviews with its External Advisory Committees on the development of nursing and counselling curricula; the relevant Nursing Committee includes Indigenous representation from UNE and the Congress of Aboriginal and Torres Strait Islander Nurses (CATSIN). School of Law Advisory Board includes the Director, Oorala Aboriginal Centre, as an ex-officio member. The School of Law has an Aboriginal academic as a member of the School’s Teaching and Learning Committee. The School of Education has Mr Steve Widders, an Anaiwan Elder, is Patron of the School of Education and is invited to significant occasions held in the School. The Oorala Aboriginal Centre is represented on the School of Education Teaching & Learning Committee by Mr Guido Posthausen for the TRACKS Tertiary Preparation Program. A local Aboriginal Clinical and Counselling Psychologist was invited to be a member of the Clinical Psychology Advising Liaison Committee that meets twice per year. Within the School of Law, Marcelle Burns (an Aboriginal law lecturer), engages with her colleagues to help embed cultural competency and awareness wherever practical into Law units. In particular, the School of Law teaches the unit LAW164 – Law and First People of Australia. Lecturer in Indigenous Health, delivers lectures and facilitates tutorials on cultural considerations when caring for Aboriginal patients. Oorala academic staff deliver and review the four OORA units it delivers. The Academic Coordinator is a member of the School of Education Teaching and Learning Committee. The Oorala Director is a member of the Deans Committee and regularly delivers reports to Academic Board. Please use the financial acquittal template attached to report on the expenditure of your University’s ISP grant for 2017, noting that a breakdown of expenditure is required (e.g. salary and travel breakdown). Where ISP expenditure does not match the audited annual financial statements for the year ending 31 December 2017 provided under section 19-10 of Higher Education Support Act 2003, please provide reconciliation. The following tables have a dual purpose of itemising actual income and expenditure associated with the ISSP in 2017 as well as estimating other funds and expenditure supporting Aboriginal and Torres Strait Islander students at the university. ISSP supplements the support the institution should already be providing to Indigenous students and the third column below helps us recognise the commitments your institution is making to lift and sustain Aboriginal and Torres Strait Islander student outcomes. If GST is paid to you, the amount of GST funding included in each payment is set out in a Recipient Created Tax Invoice (RCTI) issued to you at the time of the payment. State whether these amounts have been remitted to the Australian Taxation Office (ATO) or committed for payment to the ATO. If the organisation is subject to audit by an Auditor-General of the Commonwealth or State or Territory government this authorisation should be signed by the Chief Financial Officer or an executive officer with primary responsibility for the organisation’s internal audit function. If the organisation is not normally subject to audit by an Auditor‑General, then the organisation’s auditor should sign this authorisation.Complete this certification after reading the completed 2017 Performance Report and 2017 Financial Acquittal for the Indigenous Student Success Programme. Complete this certification after reading the completed 2017 Performance Report and 2017 Financial Acquittal for the Indigenous Student Success Programme. Indigenous Student Success Programme Funds and any interest earned or royalties/income derived from these Funds was expended on activities consistent with the Indigenous Student Success Programme guidelines and the Higher Education Support Act 2003.
it is an offence under the Criminal Code Act 1995 to provide false or misleading information. Please nominate contact officers for all policy and operational matters regarding your Indigenous Education Statement, including name(s), position title, phone number and email address. Where your Indigenous Education Unit has been consulted in the development of this Indigenous Education Statement, please provide the contact details of the relevant staff member. Following approval of the IES by PM&C, universities are to publish the current and the previous two IES on their website. The documents are required to be externally accessible to the public.